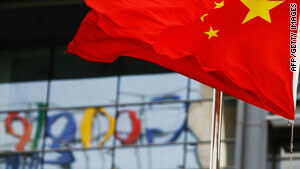 All Google searches across China appeared to have been blocked starting Tuesday afternoon. (CNET) -- China appeared to up the ante Tuesday in its dispute over Google's refusal to censor Chinese-language search results, blocking mainland Chinese Internet users from using Google search for any query. Several reports note that Chinese Internet users inside the Great Firewall of China are now unable to do any kind of Google searches at present, including banal searches that have nothing to do with any politically sensitive topics. This could be the nuclear option that Google executives always knew was possible when they decided to bypass censorship laws by hosting Google's Chinese-language search engine in Hong Kong. However, the Guardian reported that searches could be conducted via browser toolbars, implying the block could be inadvertent. Google did not immediately respond to a request for comment, and it has yet to update its China status dashboard to reflect the block. China has long blocked particular searches on Google.com, allowing Internet users to conduct the search but preventing them from clicking through to the result. That was part of the reason Google agreed to adhere to China's censorship laws in 2006, because by moving its servers inside of mainland China it could provide a much better searching experience than one that had to be filtered through the Great Firewall. China's first move following Google's decision last week was to partially block some mobile services, and the government has instructed domestic media companies to adhere to the party line when reporting about the issue.